Wales is a country which tends to be overshadowed by its larger neighbour England in many ways, and that includes genealogical research. Unlike those of Scotland and Ireland, Welsh records tend to be routinely included with those of England, a tendency which can both help and hinder. Birth, death and marriage records for the two countries are merged from 1837 when civil registration began, as are records from the first census in 1841. Military service records are also included with those of England. However, parish registers before 1837 belong firmly to Wales, and searching them brings one into contact with the Welsh patronymic system of naming, which can be confusing to those familiar with the English system. The traditional method of naming was to link the child’s baptismal name to the father’s baptismal names with “ap” or “ab” (son of) or “ferch” (daughter of) so that, for example, Evan, son of Thomas would be known as Evan ap Thomas, and Mary, daughter of William, would be known as Mary ferch William. Over time, these names became surnames, such as Thomas, Williams, Davies and Jones, although the patronymic system continued in some places into the 19th century. An incidental effect of the popularity of a few given names was that a small number of surnames came to dominate Welsh records, so you should never assume that people with the same surname are related. Wikipedia has a good explanatory article. Welsh parish registers officially commenced in 1538, and some have been filmed by the Church of Jesus Christ of Latter-day Saints. These should be available through Family Search by 2013. Marriage and christening records 1530-1906 are available through Ancestry. Census records are available through findmypast.co.uk and FreeCEN and on microfiche at GMF45 in the Genealogy Centre. The National Library of Wales is a major centre of family history information, and their catalogue can be seen at www.llgc.org.uk. The heyday of Welsh migration to Australia was the gold rush period, which saw the number of Welsh people in Victoria triple through the 1850’s. 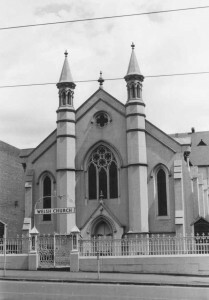 The first Welsh chapel in Victoria was built in Latrobe Street in 1857, and the Ballarat area had a particular concentration of Welsh people and churches. Another peak in migration occurred after the Second World War. See Museum Victoria’s website for further information. The most visible contributions of the Welsh today are a love of singing and poetry, now expressed through Welsh choirs (mostly male) and eisteddfods, a custom dating back to at least the 12th century. There are Cambrian Societies around the world, with the Victorian society operating from the Welsh Church. A worldwide analysis determined that 4.1% of Australians have Welsh surnames. Famous Welsh people have included British Prime Minister David Lloyd George, the present Archbishop of Canterbury Dr. Rowan Williams and the poet Dylan Thomas. Currently the most famous Australian of Welsh ancestry is Tour de France winner Cadel Evans, whose great grandfather was born in Wales. Hi Anne, Thanks for the very valuable links for research into Welsh ancestry. I’ll use them as my cousin and I are writing a Roberts family history. Our emigrant great grandfather, Philip Roberts’ father in law, Zerebabel Davies was the first minister at the La Trobe Street Church.Philip came from St Mellons, Cardiff, Wales. Do you know any websites that might help us trace Philip Roberts’ ancestry in Wales? Thank you for your question asking about any websites that might help you trace Philip Robert’s ancestry in Wales. I will reply separately to your email address. I should add that the Library has published a very useful online research guide on Researching your ancestors for the British Isles. British Isles includes in the guide England, Wales, Scotland and Northern Ireland. I meant to ask you as well, do you have any objection to me reproducing your article “Finding Cadel….” (with a reference to you as the source) in the family history? It is possible we might want to include it. Thank you for your interest in the Finding Cadel or researching your Welsh ancestry blog post. I will reply separately to your email address. Thank you for this further question relating to our Finding Cadel 2011 blog post. I will reply separately to your email address. Another addition… The family history will only be distributed to family members.We do not intend to put it online, for reasons of privacy and possible identity theft. Thank you for this clarification re your publication.